Brief Synopsis: Blue Beetle falls in over his head while investigating thefts from his business. Issue Notes: Despite what it reads on the cover, the title of this comic book is officially DC Countdown according to the publishing indicia. Story Notes: Events in this issue mark a major turning point in the history of the DC Universe in general and the life of Booster Gold in specific, firmly closing the door on the second stage of his career as a hero. HIS STORY: Booster Gold appears using the ATM card of Blue Beetle II to withdraw several hundred dollars in twenty dollar bills. Beetle's narrative box explains that in Booster's future, a quart of milk will cost almost $300. It is unclear if this information is accurate, as this second-hand information is apocryphal. PRODUCT PLACEMENT: Booster passes a Metropolis billboard for B.G.I. Mobile, a wireless telephone service. Booster explains to Beetle that he is having difficulty finding endorsement deals since he ceased wearing his costume. This discussion between friends reveals that the death of Sue Dibny has disturbed Booster more than he might typically let on. If Booster, who has defined himself via his heroic public persona, is hiding from heroics in the wake of the events of Identity Crisis, his confidence must be quite shaken indeed. Booster and Beetle dine with Maxwell Lord, their former employer, in New York City. It was Booster's suggestion that Beetle discuss his concerns about thefts from his company, Kord, Inc., with Lord over lunch. Booster pays little attention to the details of the conversation. Before the end of the conversation, Lord will suggest both Beetle and Booster's "best days in tights are behind you." PRODUCT PLACEMENT: Concerned about his own finances, Booster leaves Beetle for a sunglasses endorsement in Miami, Florida. Booster is aware that Beetle is traveling to a meeting with Bruce Wayne, the alter-ego of Batman. 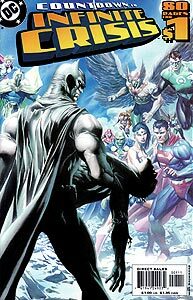 Batman only recently revealed his identity to the Justice League in JLA #50. FASHION ALERT: Booster arrives at Kord Inc.'s Chicago, Illinois, warehouse just in time to save Blue Beetle from a mob of his old foes, the Madmen. Booster has donned his Mark XII costume, including its collar, to aid his best friend, forsaking his commercial deal in Florida. Beetle and Booster continue their search into the embezzlement of Kord, Inc. funds and technology inside Beetle's home in the city of Highland Park, Illinois. Highland Park is an affluent area located 26 miles north of downtown Chicago along the shore of Lake Michigan. Highland Park is the home of several famous Chicagoans, including former professional basketball player Michael Jordan. Booster is seen admiring the Blue Beetle's magic scarab. The scarab is what gave the first Blue Beetle his superhuman abilities, including strength and flight. The scarab has never provided any benefit, other than nostalgia, for Blue Beetle II, and this is the first time that Booster has ever acknowledged seeing it on-panel. Beetle's narration reveals that he does not believe that Booster has extensive knowledge of twentieth-century events. If Beetle, Booster's closest confidant, does not believe that Booster heroics are motivated by an extensive knowledge of the 20th century, this is likely the case. Booster has frequently been very coy about revealing how much he knows about events of the present day. Booster is caught in an explosion clearly intended for the Blue Beetle. The blast would likely have been fatal for Beetle, but the armored costume and goggles prevents any permanent injury to Booster. POWER DOWN: Continuing his investigation, Beetle pays a visit to Booster in Falomir Hospital (location unknown), room 1442, to ask Booster about Skeets. Booster admits that he hasn't seen Skeets "in over a year." This statement confirms that Skeets is no longer integral to the operation of Booster's armor and has been returned to his own self-contained body, abandoned in Extreme Justice #14. Beetle's suggestion that Skeets was kidnapped, murdered, and then used for parts understandably angers Booster, though he is too weak to do anything about it at the moment due to "third degree burns over forty percent of his chest." Third degree burns are extremely severe, life-threatening injuries that generally lead to extensive scarring in survivors. Despite their severity, they are generally painless as a result of destroyed nerve endings. POWER UP: On the large video monitor is a summary of the data that Checkmate has gathered on Booster Gold. Notably, Booster's powers are erroneously described as "Bodysuit: allows for Flight (B-2), Strength (C-1), Force Field (A-5), Energy Ring (A-5)." Booster's bodysuit and Legion Flight Ring have been interchanged; it is the ring that allows for flight and the suit provides the energy blast. The scale that these letter-number combinations are graded on is unrevealed, though based on previous entries in the Checkmate database, the higher the letter and number combination, the more powerful a given power is. Previous Checkmate entries for Batman, Superman, and Wonder Woman have placed all of their powers at a level of A-2 or higher. Skeets, also listed as one of Booster's "equipment," is described as "terminated." PRODUCT PLACEMENT: Among the pictures of Booster shown in the Checkmate database are the original Conglomerate, the Super Buddies, Booster in his Mark IV armor, and Booster in a swimsuit, holding a surfboard with the initials "B.G." Booster has never previously been depicted surfing, so this is presumably an advertisement for Tannerific Sunscreen (which is listed in the previously mentioned Checkmate database under "affiliations"). Boosterrific Review: The team of writers and artists who contributed to this book should be congratulated for creating one of the most enjoyable yet controversial stories of the modern DC Universe. Fans of Booster Gold should be honored for Booster's inclusion in a story that so thoroughly explores the nature of heroism and friendship, and the self-delusions that hide true evil. This story is justifiably controversial, especially as it destroys one of the more affectionately cherished characters of a particular generation in order to make its point. However, a visceral reaction to the outcome of this story is the sign of its success in touching its audience on some level deeper than the typical escapist fantasy-fare of the average super hero comic book manages to do. Sure, this book is a tragedy, and in that is its glory. Absolutely perfect in all the worse ways. I only recently read this issue and it was truly an inspired effort and powerful story telling. 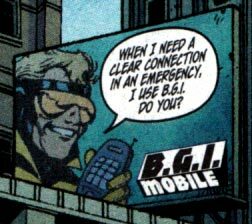 The revitalization of BG starts here in an effort that ends the Ted Kord BB era. Fitting.